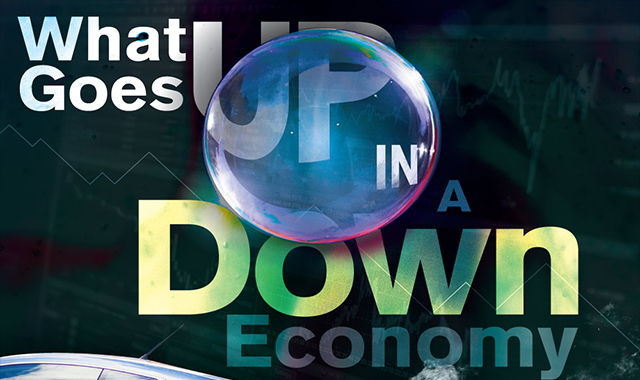 What Goes Up In a Down Economy #infographic ~ Visualistan '+g+"
What could tattoos, luxury retail, and candy possibly have in common? Well, from an economic perspective, they are all part of industries that seem to do exceptionally well even during downturns – but why? Moving through fairly predictable phases, the state of the economy may once in a while through us a curveball. Impending recessions leading to a potential depression leaves our economy and personal financials in shambles. The stock market crash of 1933 brought on the Great Depression and an unemployment rate of 25%; decades later, the Great Recession was triggered when the subprime mortgage bubble burst, some effects of which we are still dealing with to this day. Yet even in the face of such economic uncertainty, there is always enough pocket change for a treat. From our vices to necessities, here’s more on the industries that survive and thrive during economic dips, what we can learn from their success, and use those lessons to help our own business succeed no matter the economy.